In Hinduism, the river Ganges is referred to as Gaṅgā and is considered sacred. Personified as a goddess, Gaṅgā is worshiped by Hindus who believe that bathing in the river causes the remission of sins and facilitates liberation from the cycle of life and death. Pilgrims travel long distances to immerse the ashes of their kin in the waters of the Ganges, bringing their spirits closer to nirvana. Thailand, candlelit floats are released into waterways to honor the Buddha and the goddess Ganga for good fortune and washing away sins. 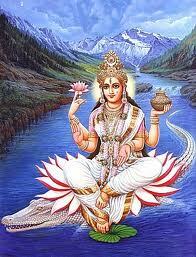 There are several Hindu beliefs that give various versions of the birth of Ganga. According to one version, the sacred water in Brahma's Kamandalu (water vessel) became personified as a maiden, Ganga. According to another (Vaishnavite) legend, Brahma had reverently washed the feet of Vishnu and collected this water in his Kamandalu. According to yet a third version, Ganga was the daughter of Himavat, king of the mountains, and his consort Mena; she was thus a sister of the goddess Parvati. Every version declares that she was raised in the heavens, under the tutelage of Brahma. disturbed. The sage opened his eyes for the first time in several years, and looked at the sons of Sagara. With this glance, all sixty thousand were burnt to death. learnt of this fate, he vowed to bring Ganga down to Earth so that her waters could cleanse their souls and release them to heaven. heavens. Alarmed, Bhagiratha prayed to Shiva that he break up Ganga's descent. worlds – Swarga (heaven), Prithvi (Earth) and, Patala (netherworld or hell). Thus is called "Tripathagā" (one who travels the three worlds) in Sanskrit language. It is sometime believed that the river will finally dry up at the end of Kali Yuga (the era of darkness, the current era) just as with the Sarasvati river, and this era will end. Next in (cyclic) order will be the Satya Yuga or the era of Truth. which lists the rivers from east to west. In RV 6.45.31, the word Ganga is also mentioned, but it is not clear if the reference is to the river. the Ganges. In RV 1.116.18–19, the Jahnavi and the Ganges River Dolphin occur in two adjacent verses. According to the Hindu scriptures like Skanda Purana, the goddess Ganga is foster-mother to Karttikeya (Murugan), who was actually a son of Shiva and Parvati. waters of the Ganges. Therefore Ganesha is said to have two mothers—Pārvati and Gangā and hence called Dvaimātura and also Gāngeya (the son of Ganga).